The results showed that a single injection of MPCs into degenerating intervertebral discs reduced low back pain and improved function for at least 12 months. When compared with controls, MPC-treated patients used less opioids for pain relief, had greater radiographically-determined disc stability, and underwent less additional surgical and non-surgical treatment interventions. MPC treatments also appeared to be well tolerated during the study. Mesoblast Chief Executive Silviu Itescu said: "We are very pleased that in a trial primarily designed to assess the safety of Mesoblast's cells for intervertebral disc repair, we have seen strong indications of sustained efficacy across a broad number of clinical and radiographic parameters after a single intra-disc injection. On the basis of these positive results, Mesoblast plans to meet shortly with regulatory authorities in major jurisdictions, including the United States Food and Drug Administration, to discuss product registration trials for the potential treatment of disc degeneration." 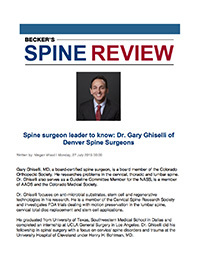 Dr Gary Ghiselli, Clinical investigator and local, fellowship-trained spine surgeon at Denver Spine Surgeons said: “We are very excited by these results. 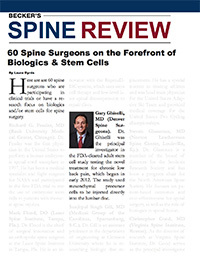 This is compelling evidence that stem cell technology has the potential to change the treatment of spinal disease. Physicians and patients are seeking access to a new modality to treat patients with this highly debilitating disease for whom there are limited options. We hope that these outcomes will be replicated in a pivotal trial." The results of the Phase 2 clinical trial build on and extend previously reported preclinical studies which showed that Mesoblast’s highly purified and immunoselected MPCs were able to increase proteoglycan content and improve disc structure in an experimental ovine model of disc degeneration. Mesoblast's Phase 2 clinical trial enrolled 100 patients with moderate to severe low back pain persisting for more than 6 months and caused by early disc degeneration. 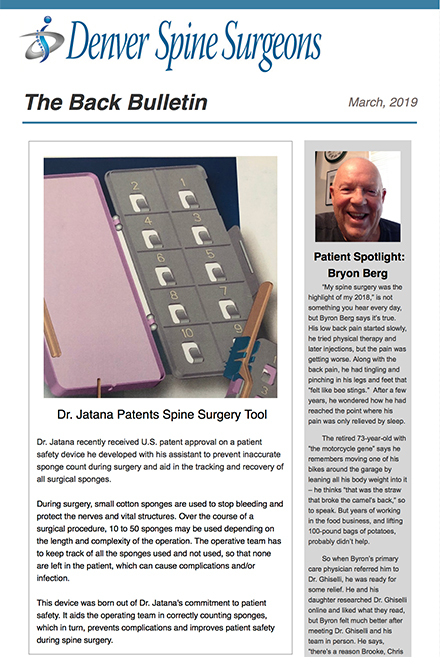 Patients underwent the outpatient injection for a single painful degenerated lumbar level and are being evaluated for safety and efficacy over a total of 36 months to evaluate long-term treatment effects. Click here to download a Mesoblast Stem Cell Production Visual. 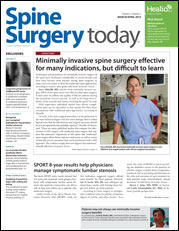 Gary Ghiselli, MD, Sanjay Jatana, MD, David Wong, MD, MSc, FRCS (C), Nicholas Wharton, MD. Pseudarthrosis in the Cervical Spine: What Is the Gold Standard? CT Scan versus Flexion Extension Quantitative Motion Analysis With Intraoperative Correlation. Proceedings of the NASS 21st Annual Meeting / The Spine Journal 6 (2006) 1S–161S. Purpose: Attempt to establish a gold standard for determining pseudoarthrosis in anterior cervical fusion. Read more.